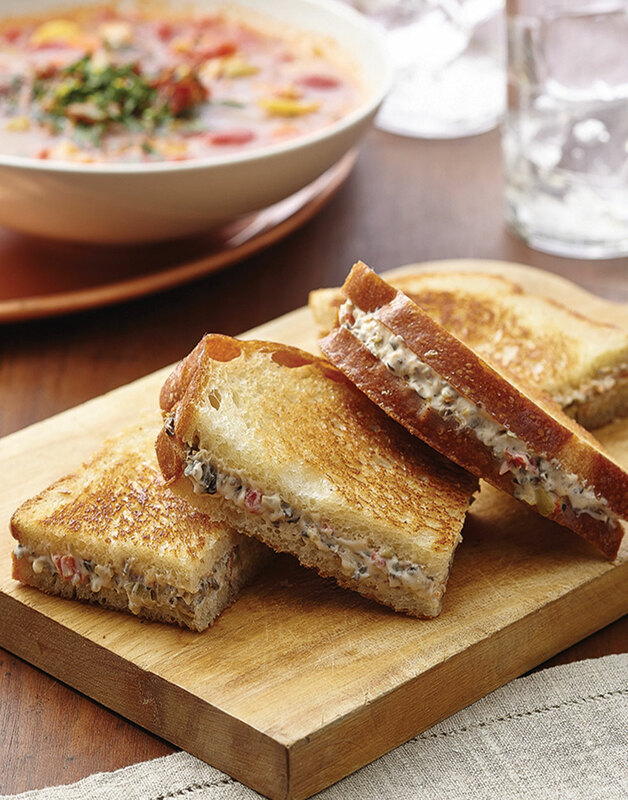 For a double dose of comfort, turn olive tapenade into a thick, creamy spread; then turn it into grilled cheese. This will be the most amazing grilled cheese you've ever had — crisp, buttery toasted bread with ooey, gooey, cheesy tapenade in the middle — hell yes! Blend cream cheese, 8 Tbsp. butter, olives, pimentos, and garlic with a hand mixer until combined; season with salt and pepper. Brush one side of each bread slice with remaining 4 Tbsp butter; place on a cutting board, buttered side down. Assemble sandwiches by spreading about ½ cup tapenade on three of the bread slices; top with remaining bread slices, buttered side up. Cook sandwiches in a nonstick skillet over medium heat until golden on both sides, about 5 minutes total. Transfer sandwiches to a cutting board; let rest 2 minutes before cutting each in half. Refrigerate remaining tapenade. It makes a great snack spread to serve on crackers.